Hi Gang. Hope all is well. Love the sight and all of the usual information. 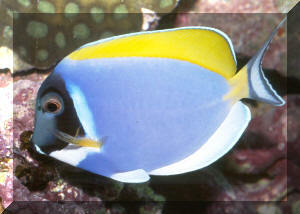 I've got a small, I believe anyway, issue with a powder blue tang I've had for a few years now. Visually the fish is very healthy and happy. It is active all day picking at algae as you would expect, it's color is very sharp and vivid and its body is nice and thick. I feed a regular variety of quality marine food, both frozen and flake, as well as Nori to supplement. My setup is a 150 gallon tank with liverock and your standard sump wet dry/protein skimmer combination. My "issue" is that for the last 12 months or so it will swim alongside something and scratch itself. point of it likes to scratch itself, but the 20 years of experience tells me something must be causing this. I have 4 or 5 other fish in the tank as well and none of them exhibit any issues health wise either, difference being that they don't scratch themselves. My water parameters are exactly where you'd like to see them and I have tested them many times for accuracy. Basically I'm stumped. Any thoughts on what the issue might be? Could it be something internal and, if so, any recommendation treatment/medication wise? Thanks!